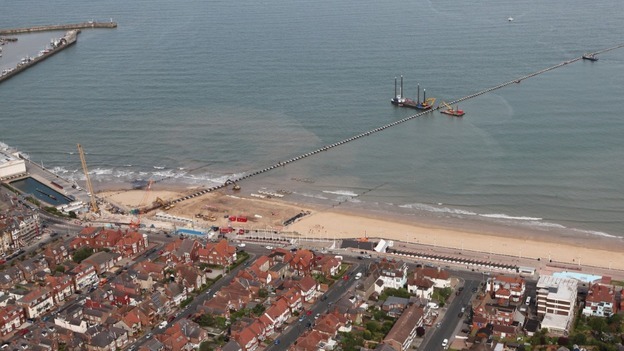 Tasked by Arup, working for Yorkshire Water, we were asked to capture the moment a large waste water pipe was placed across the beach into Bridlington, part of a large scheme to keep the east coast beaches safe from pollution. Peter Smith commissioned Helijet to fly this task with him, due to their experience in survey and photography work. It was necessary to tell the whole story from when the Tugs arrived offshore towing the 1 kilometre long pipeline, through to completion, to be on station with the helicopter, shooting video and stills throughout the day. To give some scale to the picture you can see 7 tugs in attendance. The task had to be completed at certain times to coincide with tidal conditions, meaning that it was impossible to stay in the air for the whole 8-hour period. In advance of the task we established an air to ship comms link to the lead tug to make the job easier, we then landed at a pre-arranged site nearby and waited for the call to come in on 6 occasions, in between we had to fly twice to refuel to a nearby airfield already pre arranged. With tasks like this planning is the key to success, sometimes the planning time is far greater than the actual flying time.